Stay warm with this NFL New England Patriots - Throwback 47 Brand Breakaway Knit Hat. 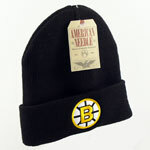 Features the classic New England Patriots logo on the front of the cuffed edge. The hat has stripes and a pom in the colors of the throwback uniforms. One size fits all. Officially licensed by the NFL.